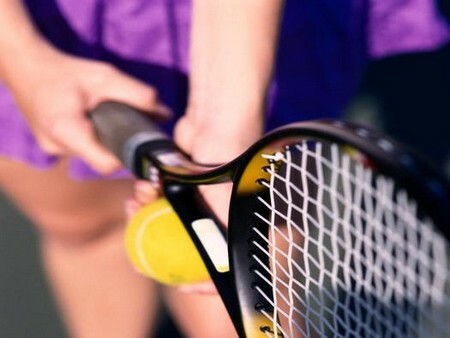 Tennis is a widely growing sport mainly for the young and energetic players. Not only the United States folks play it but also many people from all parts of the world started playing this sport. To become a master of a sport, one must be very much clear about its skillful strokes and all the motions. Here in this sport you have an important skill, which is the skill to serve the tennis ball. One can win a tennis match even with the help of the way he serves the ball. Now read the following instructions which will remove your difficulties while serving a tennis ball or it shows you how to serve it. How tight you hold the tennis racket will decide your serve. The grip is an important thing to be noted. In simple words “hold your tennis racket as a hammer”. A good player’s important quality is to know the clear visualization of the tennis court. You must decide the place where to place the ball. The important thing to note is, the ball should not hit the net and it should not cross the play area. A right-handed player should stand in such a way that his left foot must be in front of his body behind the serve line with his right foot little back. A left handed player must do the opposite. Stand in sideways such that the shoulder is ready to rotate in order to hit the coming ball from the opposite side of the court. Now the instructions are given considering a right-handed player. Reverse the procedure for left-handed players. The first thing is, you just toss the ball in front to find the place to serve and then toss the ball in the air such that you must note the height that the tennis racket can reach. The main goal is to hit the ball in the air such that it will reach the opposite side of the court. This should be done with accurate timing. Now enter into the court and wait for the ball to return from the opposite player. Go and hit the ball in such a way that it doesn’t goes out of play or hits the net. As soon as you hit the ball, bend your wrist enough to hit the ball again. At the same time extend your hand and hold the racket downwards. This complex action will become an easier one when you master the sport.